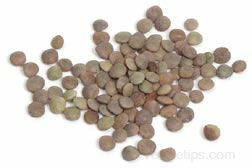 "Great info on dried pulses, beans, lentils, peas." Terms that are used to describe many different types of dried beans, lentils, peas, or pulses. Hindu in origin, the terms typically pertain to split and most often skinned varieties of beans, lentils, peas, and pulses. The use of these terms can also refer to seasoned food dishes made from the various legumes prepared and cooked in water. Some of the common dals include Moong Dal, Mung Dal, Urad Dal, Tuvar (Toor) Dal, Masoor Dal, or Channa Dal. Since a cooked lentil or small split pea does not retain its shape well after being cooked, dal dishes typically are puréed.